Anansi playground building is located in the Utrecht district Kanalen eiland in the Netherlands, this unique and fun building has been completed by Mulders vandenBerk Architecten. 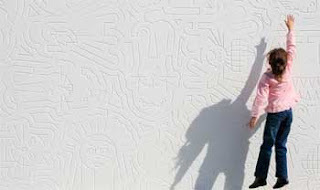 The exterior wall is engraved with fairy tales graphic that stimulate the imagination. The playground is split into 2 zoning section, the part of playground consists of sports fields is aimed for teenager and the other half is a playground for young children. 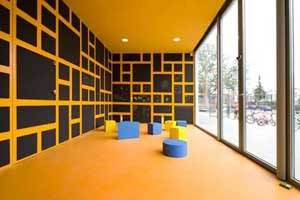 The interior of this innovative playground is divided into three different playroom, each playroom has different color and has different facility. 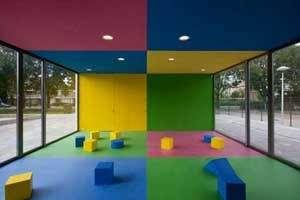 Al of playrooms encourage children to play with color, shape and imagination to stimulates their creativity. 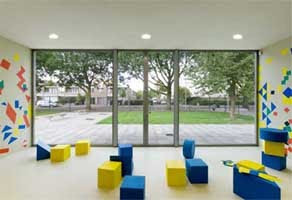 The most special aspect of this building is the interaction between the user and the building environment, each part and each section of this playground has it’s own way to stimulates children creativity and imagination.